Pregnant women can exercise too. Here are some tips on how to adapt your fitness program to work with your pregnancy. From new movements with an extra weight (the baby) to simply recovering from pregnancy and labor, your body has different needs than it did before. Find out how to adjust your workout to your new lifestyle. Exercise is good for everyone, especially if you're a mom or mom-to-be. 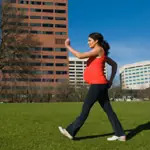 Follow these exercise tips through the trimesters of pregnancy, and those that follow. Now that you're expecting, navigating the gym can be extra-tricky. We've got the goods on what's safe (and what's not), plus the best classes, cardio and weight training for pregnant women. Strengthen your abs for pregnancy, control your breathing during childbirth, and quicken your postnatal recovery with Pilates. Cycling During Pregnancy: Yes or No? During pregnancy, a certain level of exercise is generally thought to be helpful. Find out if that includes cycling. From regulating body temperature to maintaining oxygen flow to the fetus, find out everything you need to know about prenatal exercise with this guide for pregnant athletes and their trainers. Each year 6 million women are faced with infertility. Find out what you can do to improve your chances of becoming pregnant.